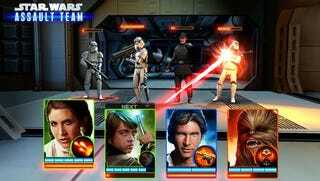 This is Star Wars: Assault Team, coming this spring to Android, iOS and Windows 8 devices. This is Star Wars: Assault Team, coming this spring to Android, iOS and Windows 8 devices. What is it? Not a clue. All we've got is this image from the official Star Wars Twitter. I'm thinking free-to-play collectible card game. As long as it's better than Star Wars: Force Collection I'm game. Star Wars: Force Collection is pretty sad.